After nine months of travel, it finally happened to us. We were beginning to think that without Sofi to provide endless airport adventures, we were destined to have pain-free travel for the remainder of our trip. 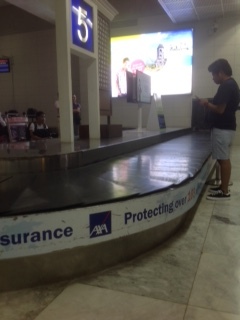 But alas, there we were at the baggage claim in Manila, Philippines, without our luggage. Our bags had been left in Vietnam and we had taken the very last flight coming from Ho Chi Minh to Manila. Just perfect, right? We spent plenty of time waiting at this baggage claim! Chargers– Adam had his computer, but not the charger. That made the last few uses of the computer pretty intense as the battery continued to drain! Extra clothes– even just one extra outfit will do. If you’re traveling in the heat of summer in Asia, one pair of clothes is usually not enough to last you ten minutes (if you sweat like we do). Valuables– it seems obvious, but make sure your passports, credit cards, and any other valuables are directly on you and never in your luggage. We’ve seen too many friends lose luggage throughout the year, and some don’t get it back! Long sleeves– if your extra outfit doesn’t include a long sleeve, you may want to add that to the list. Airplanes and cafés with air-conditioning can get really cold for some people (*cough* Karen), even if the temperature outside is blazing. Emergency snacks– Though you can always purchase food at the airport, keeping emergency snacks in our carry-on is something we plan to from now on (although we promised to always have emergency snacks after our debacle on the mountain in Peru, yet here we are). Arriving late at an airport and waiting for your bags for several hours can certainly work up an appetite. A good sense of humor and a positive attitude– as we filled out our forms for lost luggage, one thing became clear to us: the employees working at those desks tend to get mistreated. They are in a “thankless” position so to speak, because most every customer they talk to is upset about not having their bags. We saw how others treated them and decided that we were going to be patient and as friendly as possible, because mistakes happen and they weren’t the cause of it anyway! And what did that end up doing? It got us a decent compensation for our bags, which ultimately got into our possession days later. The office where they issued our “inconvenience” money. Do you have any lost luggage stories of your own? How many of the items we listed do you already include in your carry-on? Any other airport adventure stories you would like to share with us? Let us know in the comments below! Hilarious guys! Way to have a great attitude! I can agree that a contact lens case would be horrible not to have with you! We try to bypass baggage claim as much as possible. I wear all of my clothes on the flight to make my bag smaller and we shove everything in the over head compartment. Bright side… did you get new undies? We definitely have some travel things to learn from you guys! Karen’s eyes were really dry until we got some extra solution and then she put her contacts into two different glasses! Haha. I’ve learned from previous travel experiences that I should never check something if I can avoid it, but our bags are just too big. Maybe you can show us how it’s done 🙂 And unfortunately, no new undies. Decided to go with smelly old ones! Miss you guys and can’t wait to chat soon! I like what you have to say about being nice to the people who have to deal with your problems. I try and apply that in many situations, knowing the person I’m talking with (on the phone included!) isn’t really the person responsible for my issue. A good reminder! Especially in certain countries (ahem, Thailand), raising your voice is definitely NOT a good strategy for getting on someone’s good side! Bypassing baggage claim is ideal but not realistic when you have your whole life packed in your bags! So crazy not to have underwear, computer charger, etc… we don’t usually include the charger either for its size/weight so need to re-think that. Because replacing that from overseas is a little tricky. On certain airlines (American) if you are at the end of the line boarding the plane, they say “All the overhead compartments are full, from now on all carry-ons need to be checked curbside.” Um… happened to us once, we were not willing to put our computers and camera underneath (even though you *usually* pick it up right after you step off the plane). So we caused a scene and pulled out a big pile of stuff to hand carry onto the plane. Then we got to our seats and the overhead compartment was completely empty! Moral of the story, get to your gate and line up early for American if you’re traveling within in the US! I have temporarily lost my luggage or been ‘detached’ from it at least three times now. So I have learned a few tips along the way. Underwear is the main one! For the “must have” items, you can only fit so much into a certain-sized bag for some airlines. Especially small planes, they have extremely limited space above and by your feet, so a backpack or small bag (not a rollerboard) is the only option. So double-check what you’re workin’ with. >Always pack: 2 pairs underwear, 1 pair socks, 1 extra shirt, toothbrush, valuables, small pack of tissues, three days’ medication, hand sanitizer, lotion, and something to do (book to read or iPod+charger!). I tie a sweater around my waist– risk looking like a dork– for the sake of having something in those AC environments. >Always travel snacks! Something sweet and something salty. If I can bake/prepare myself, I’ll bring some banana bread or granola, or fruit which can be peeled (that way you don’t have to figure out how you’re going to wash it properly). Those are some go-to travel snacks of mine. But you can’t take fruit across borders so that’s just for intra-continental flights. >For cross-world flights (8+ hours) I like a pair of pajama pants to change into… they’re so much more comfortable for sleeping, and the routine of putting on my pj’s, brushing my teeth, etc. helps me get in the mood for sleep, even if its only a 2-hr nap. >It’s nice to have a pen on-hand for filling out customs forms before you arrive. Speeds the border check-in process. Especially if you’re at the front of the plane, you can pretty much zip right through when you’re the first to get to security! (Not if you’re entering the US through LA though… be prepared to wait a LONG time to get in, get your luggage, and get out with your luggage). *And a *perk* when traveling with a husband, you can pack all of the heavy stuff in his bag and you carry the light stuff! Woohoo! Or at the very least, you can work together and don’t have to keep ‘your’ stuff separated if there’s a better way to fit it among two bags instead of one. Dang! Looks like you’ve got it down, Lisa! You’re absolutely right about treating people nicely. Did they want you to lose you bags? Of course not! Heck, they weren’t even at the airport that lost your bags. In our case, they didn’t even work for the airline. All of your suggestions are especially important for me to remember, because I’m usually minimalist when it comes to carrying things with me. We definitely won’t forget an extra pair of clothes next time! That’s for sure! Hey Guys! Sorry to hear about your lost luggage story. When I was in high school, we went on a family vacation to the Dominican republic. My mom always told us to pack an extra pair of underwear and bathing suit (when going to a tropical vacation spot) in our carry-ons, which we thought was silly, but we obliged. We arrived in Juan Dolio, Dominican republic sans luggage (two large suitcases total for my mom, dad, sister and I for our 7 day vacation). We were thrilled not only to have the underwear but especially the bathing suits. Cell phones and chargers were not an issue then as they were just becoming mainstream. My dad took a cab to the airport daily to sift through the luggage to try to find ours (which was their way of allowing us to find our bags). Finally, on day 5, they had arrived! It was hilarious, because for the next 2 days I swear we all changed outfits 3-4 times per day just because we could. Also, after this experience, we never allowed my dad to put his “Continental preferred” luggage tags on the luggage…he traveled a ton for work, so was in every preferred club out there. To this day, we still tease him saying a disgruntled employee delayed our bags! Miss you guys! Keep up the optimistic attitude! We love this story, Heather! So great. And it’s hilarious that you don’t let your Dad live it down. Favorite part of the your story is that you changed outfits just because you could. Seems like a luxury after you’ve been prevented from doing it! We’ll take your advice and pack some of those items in our carry-on the next flight we take 🙂 Miss you and Dan and we’re so excited for the Gerber baby on the way! Oh no! 3 days without fresh clothes – yuck! Glad you got your bags back!! Thanks Sheila! I was the same with the underwear rule, but now I feel like I have to oblige and pack it anyway. Lightning hopefully doesn’t strike twice, but if it does, we will be ready! Extra: 1 pants & 1 shirt (destination(s) weather appropriate), 2 pair underwear, 2 pair socks, something warm for arms on flight, valuables…done. Super Power Heroes! Hahaha I forgot about that. I like your list! Mine was previously as follows: valuables. I guess I need to add to the list for future flights! That’s a great tip, Peg! Your story about Gene says it all. Isn’t it amazing that two bags without tags can make it all the way home without anyone noticing? We have some smaller tags, but it would do us well to heed your advice and get something more obnoxious to avoid all confusion! Hey Emily! Did you mean to write a comment here? If so, we can’t read it. Miss the three of you! !